Environmentalists warned in mid-September that killing for ivory by organised syndicates was being carried out on an “industrialised” scale – between 1 500 and 1 800 elephants are being poached a year, mostly in northern Mozambique. In Niassa National Reserve, the country’s largest game reserve, the World Conservation Society (WCS) counted 22 poached elephants in the first two weeks of September alone. “The killing of elephants in the north of Mozambique is reaching proportions never seen before. The killing of elephants is being industrialised,” said Carlos Pareira, an advisor to the WCS. 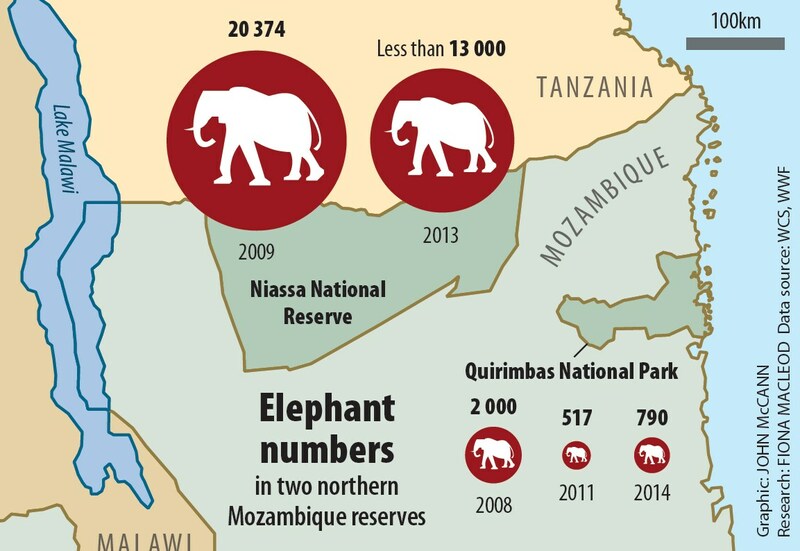 Between 2009 and 2013 Niassa’s elephant population was reduced from 20 374 to less than 13 000. According to the reserve’s administrator, Cornélio Miguel, an average of five elephants are now being killed there daily. In the Quirimbas National Park, the elephant population was reduced from about 2 000 in 2008 to 517 by 2011, according to the Worldwide Fund for Nature (WWF). Baldeu Chande, the administrator of Quirimbas, estimates the park now has a maximum of 790 elephants. Valois’s investigation, started in November 2013, reveals a web of official complicity in the slaughter among administrative, judicial and tax authorities in the northern provinces of Cabo Delgado and Niassa. The poaching networks on the ground consist of armed hunters: Mozambicans, Tanzanians, Somalis with high-calibre weapons. They smuggle their illegal proceeds through Mozambican ports, airports and borders, destined mainly for China or Vietnam. Until March this year, under Conservation of Forest and Wildlife legislation they only received small fines when caught. In April a Bill was approved that sets prison terms of two to eight years for offenders. The illegal use of firearms and ammunition is itself a crime, resulting in a jail term of eight to 12 years. But documents show that, despite the laws, officials are facilitating these crimes. Some sell weapons and ammunition, military uniforms and boots, and others facilitate the release of detainees and the disappearance of evidence. The investigation discovered 15 cases involving armed poachers in the Quirimbas National Park, dating to between 2009 and 2013, which were forwarded to the Criminal Investigation Police, the Prosecuting Attorney and the Provincial Court – with no outcome. Even some poachers brazenly walking around with AK-47s were released. One syndicate comprising four alleged poachers was arrested in Quirimbas in 2010 after killing three elephants. Charges were laid against Manuel Kachupa, Jorge Salimo, Luis Assima and Antonio Amisse, but they were released. In another operation against the same group in 2011, 106 rounds of AK-47 ammunition and 104 114 meticais in cash were seized. This time Luis Assima, head of the group, got wind of the arrests and left the day before with another accused, Manuel Kachupa, to hunt with three automatic weapons. Kachupa is a ringleader, but appears untouchable. In August 2011 he was captured with more than 90 000 meticais in cash and a week later he was released after paying a “deposit” of 20 000 meticais. In another case, after he was caught chasing a group of six elephants, he managed to escape with a rifle, ammunition and three elephant tails. He was re-captured and detained in the maximum security prison, but four days later he was released. These are just some of the cases of possession of elephant products, large amounts of cash, unlawful firearms and ammunition that have not been followed with legal action. One policeman said there was no money to feed the poachers in jail. Another insider alleged that a “deposit” of 15 000 meticais was guaranteed to secure released from prison. Contacted for comment, the current prosecutor for Cabo Delgado province, Bernardo Mecumbua, referred the reporter to his spokesman, deputy prosecutor Wilson. Wilson said that in the past two months four poaching-related cases had been brought before the courts, and more were on the way. However, he was not able to give details of the cases, nor of those arrested, or released. In the province of Cabo Delgado, the administrator of the district, Ancuabe Eusebia Celestino, and the chief secretary of the village of Muaja, Horace Radio, provided weapons used in the killing of so-called “problem” elephants which they said were destroying farms around the Quirimbas National Park. For four days our reporter accompanied poachers in the district of Ancuabe, talked with community members and searched the forests for elephants. But the elephants were wary and avoided us. However, we saw logs of the hardwood species pau preto scattered through the forests waiting to be collected. That week, elephant poachers and the illegal loggers were aware of our presence, some even said to us, “this is wrong, there is no business”. In Muaja, village chief Horace Radio denied his involvement in poaching, despite the fact community members were able to prove otherwise. 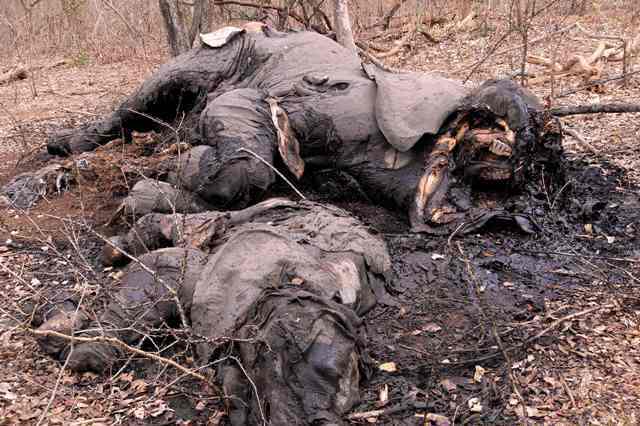 About 10 elephants were slaughtered in Nonhala, Namaika and Montepuez river. They were slaughtered by day, “against the wind, with a shot in his forehead or heart and the elephant falls on the spot”. The killing groups consisted of three to six persons, including watchmen and “scouts”. It is a rapid procedure: the poachers catch, kill, with an axe cut away the flesh on the forehead of the elephant, remove the tusks and deliver them to the clients, owners and/or arms suppliers. “I had a gun that the manager gave us, here with the village chief, who received the gun from the hands of the administrator himself,” said one of the group. “The secretary called me go to shoot elephants,” he recounted. “I managed to shoot down two elephants, a large female and her offspring. The third weapon, a Russian Mauser, we received from the hands of a tax officer named Terenciano Faire in Quirimbas National Park. A second poacher corroborated his teammate: “The administration brought two guns, one a Russian brand. We were taken to New Zambezia because there was an elephant who assaulted a woman who ended up losing her life. We slaughtered the elephant. 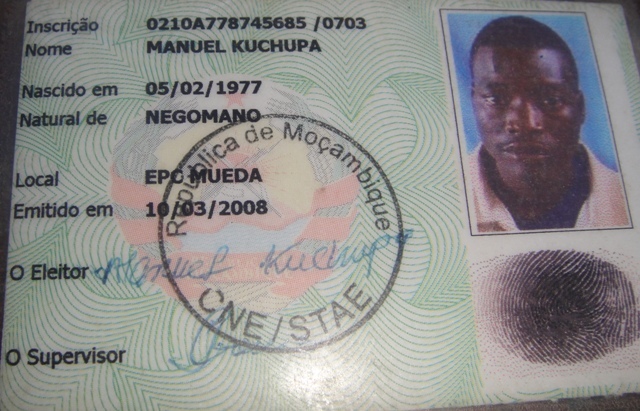 In Muaja, another weapon was delivered to a poacher by “a former military major” named “Emilio”. In Quirimbas the administration has no autonomy to kill or cull elephants, either inside or outside the park. “Problem” animals must be dealt with by the provincial department of agriculture, and they must inform the park that they will send men to drive but not to slaughter the animal. Of the elephants slaughtered on orders from the administrator during the past four years, neither the park administration nor the provincial directorate of agriculture of Cabo Delgado received any ivory. These facts were confirmed by both institutions. The agriculture department’s forestry and wildlife division in the town of Pemba confirmed that the following districts had made delivery of tusks of ivory: Mueda – 18, Mocimboa da Praia – 16, Muidumbe – 1. No tusks came from the Ancuabe district. 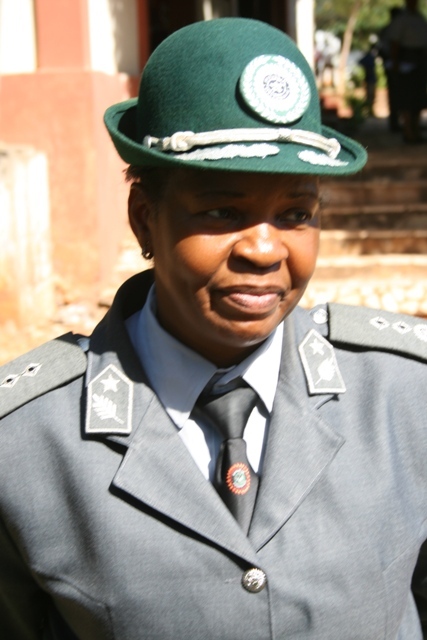 At the airport and port of Pemba, security sources said the provincial police commander, Dora Manuel Manjate, abused her power to facilitate the passage of ivory, rubies and other illicit products for Chinese clientele. They said when police and customs officials questioned the commander, “we are threatened by the commander and assigned names by the Mofid forestry company [Mozambique First International Development], a friend of the commander’s”. Illegal shipments are often hidden among timber transported in shipping containers. After confirmation in the geography department and from a member of the municipal council of Pemba, we tracked down commander Manjate’s home, located about 200m from the beach with a stunning side view of the sea. On entering the house, we found Mozambican workers and a Chinese company, CN-Balcony Buildings, busy with construction. According to them, the construction will cost in the region of one million one hundred thousand meticais.